Luke was a Gentile, a physician, and one of Paul’s fellow missionaries in the early spread of Christianity through the Roman world. He has been identiﬁed as the writer of both the Gospel which bears his name, and its sequel, the Acts of the Apostles. He had apparently not known Jesus, but was clearly much inspired by hearing about him from those who had known him. Luke wrote in Greek, so that Gentiles might learn about the Lord, whose life and deeds so impressed him. In the ﬁrst chapter of his Gospel, he makes clear that he is offering authentic knowledge about Jesus’ birth, ministry, death, and resurrection. The Gospel is not a full biography—none of the Gospels are—but a history of salvation. Only Luke provides the very familiar stories of the annunciation to Mary, of her visit to Elizabeth, of the child in the manger, the angelic host appearing to shepherds, and the meeting with the aged Simeon. Luke includes in his work six miracles and eighteen parables not recorded in the other Gospels. In Acts he tells about the coming of the Holy Spirit, the struggles of the apostles and their triumphs over persecution, of their preaching of the Good News, and the conversion and baptism of other disciples, who would extend the Church in future years. Luke was with Paul apparently until the latter’s martyrdom in Rome. What happened to Luke after Paul’s death is unknown. Early tradition has it that he wrote his Gospel in Greece, and that he died at the age of eighty-four in Boeotia. Gregory of Nazianzus says that Luke was martyred, but this testimony is doubted by most scholars. In the fourth century, the Emperor Constantius ordered the supposed relics of Luke to be removed from Boeotia to Constantinople, where they could be venerated by pilgrims. I Almighty God, who didst inspire thy servant Luke the physician to set forth in the Gospel the love and healing power of thy Son: Graciously continue in thy Church the like love and power to heal, to the praise and glory of thy Name; through the same thy Son Jesus Christ our Lord, who liveth and reigneth with thee, in the unity of the Holy Spirit, one God, now and for ever. Amen. II Almighty God, who inspired your servant Luke the physician to set forth in the Gospel the love and healing power of your Son: Graciously continue in your Church this love and power to heal, to the praise and glory of your Name; through Jesus Christ our Lord, who lives and reigns with you, in the unity of the Holy Spirit, one God, now and for ever. Amen. A couple of things in the bio could be put a bit more strongly. ‘Much inspired by hearing about him from those who had known him’ seems a bit insipid for someone who gave his life to Christ and joined in Paul’s missionary work. And ‘he makes clear that he is offering authentic knowledge’—he is putting eye witness accounts in writing, and was an eye witness himself of some of the events described in the Acts of the Apostles. It would be more realistic to say Luke is thought to be physician and a gentile – as what we know is only by legend. I agree. Why perpetuate the legend that Luke was a physician. Why are we commenting on Luke? Previously the SCLM said that they were not considering BCP 79 ‘Red’ Letter days on this blog because changing them would involve a change to the BCP and General Convention’s approval (twice). Previous ‘Red’ Letter days (Mary Magdalene, James, Transfiguration, Mary, Bartholomew, Holy Cross, Matthew, and Michael) have not been included since this blog began July 1. Has the SCLM changed their mind? The first line of the fourth paragraph would read more smoothly if “apparently” were moved to precede “with Paul”. Amen to Ann Fontane’s comment. The identification of the author of “Luke” with Paul’s companion rests entirely upon the similarity of the names. The identification of the third Gospel as “Luke’s” dates only 170 or so. By 4010, historians may be confusing John Smith of Jamestown with Joseph Smith the Mormon, but we should know better. If the consensus dating of Luke’s Gospel to the 70’s or 80’s is correct, Paul’s “beloved physician” would have been getting on in years. I remember a computer study of Luke’s vocabulary years ago that “proved” the author was a physician, or it did until people tried the method on other Greek authors of the period and found that all of them were physicians, too. 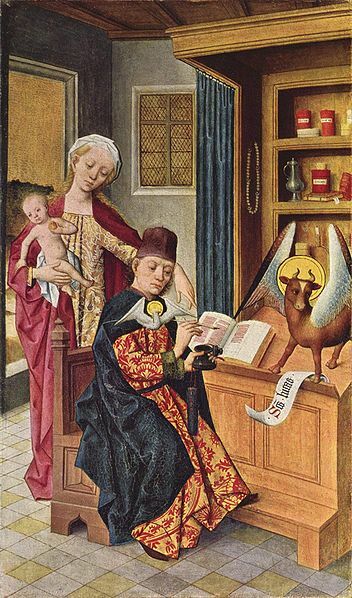 What the author failed to notice was that the “liberal arts” curriculum of Luke’s time incuded medicine and architecture as well as the medieval seven. If Luke wrote in Greek “so the Gentiles might learn about the Lord,” why did Matthew write in Greek? No one’s questioning Luke’s inclusion in the calendar, but we’d like to see the write-up brought into conformance with current scholarly opinion on Luke’s biography.